The Bicycle-powered Cinema on New Year's Day! Delighted to have raised the minimum amount of funding we needed (you can still pledge using this link) it will be happening on New Year's Day @ 5pm on the KGV Field, Wivenhoe. Transition pop-up cafe will give you free hot drinks and snacks. Just bring a blanket to sit on. Don't forget, please help by making a micro pledge over on our Kickstarter page. It Almost Really was a Nightmare Before Christmas. Gusting winds on Christmas Eve played havok with our screen (it was borderline dangerous), so we had to retreat to the Scout Hall at the last minute for our screening of Nightmare Before Christmas. It was disappointing not to do the film outside, especially as later in the evening it calmed down and turned into a beautiful clear winter's night, but those are the shakes when you try and do things outside. Hopefully everyone that wanted to come found the signs that we put up at the entrances to the field. Then we had a technical hitch with the sound too, a dodgy connection meant we had to ditch the EQ shortly after the film started. Grrr. So apologies for the slight pause and the EQless sound, hopefully it wasn't too disruptive. It's all fixed for Chasing Ice on Monday. 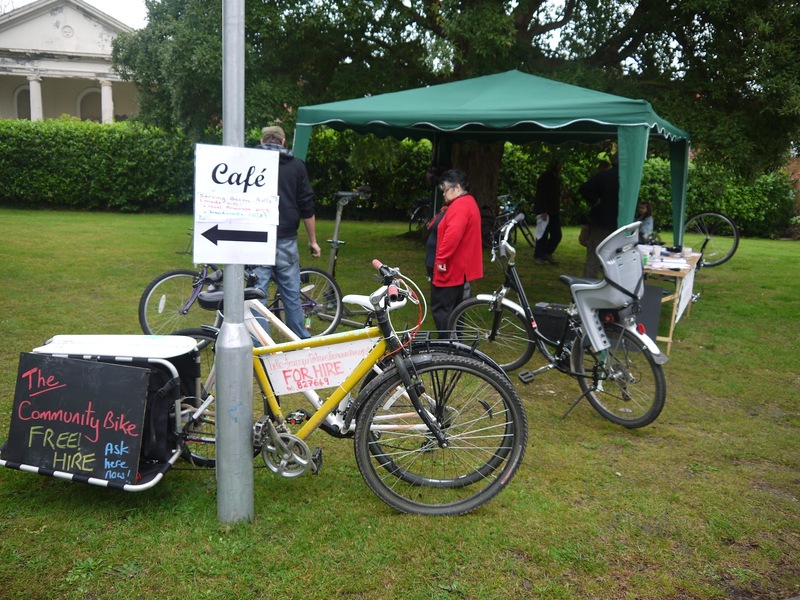 On the upside we raised around £50 for Wivenhoe Helping Hands, Cycle Cinema's new screen looks fantastic and the Food Group's pop up cafe had some very excellent treats on offer. Happy Christmas everybody, and a big thanks to all that came, The Station Hotel for sponsoring the film and all who helped out. The Revolutionary Bicycle Powered Cinema and Transition Town Wivenhoe are pleased to invite you to a very special screening of this family favourite. The Revolutionary Bicycle Powered Cinema and Transition Town Wivenhoe will show this visually stunning film outdoors on a giant screen WITH YOUR HELP!!! 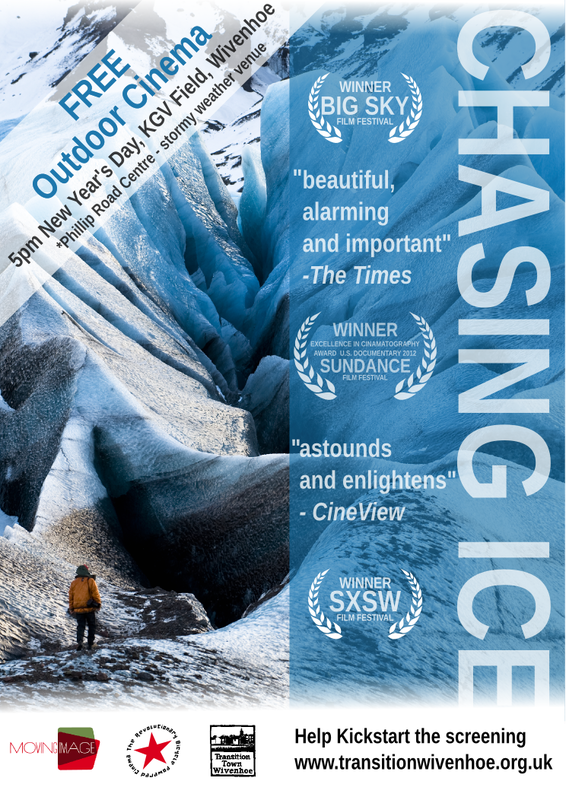 Thanks to Wivenhoe's pop up cinema Moving Image for their support. On 30th and 31st of January I will be attending a community training event run by Trafford Hall. This course gives community volunteers the knowledge and enthusiasm to set up a local project to repair/remake clothes, swap clothes, make other things from clothes (e.g. bags, cushion covers) - through to development as a small local enterprise. There will be lots of hands-on practical work over the 2 days to help you get to grips with some new skills. I'll be bringing my new skills back and inviting you all to join in the fun, so watch this space! 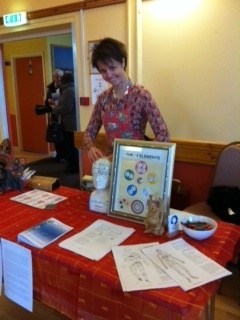 Transition Cafe helps make Health & Healing Fair a great success! 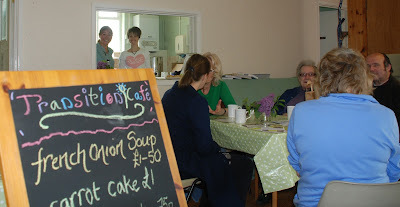 In full swing: some of the cafe team which included: Ruth, Rosie, Lucy, Jean, Catherine, Hilary, Denise, Geoff and Jo. Ok, ok, so it wasn't just us. 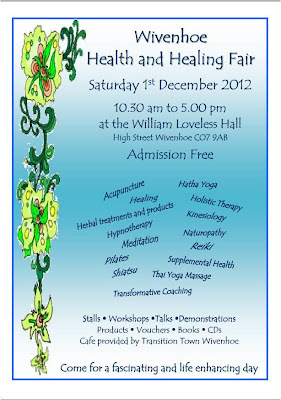 An awful lot of work obviously went into the planning and amazing staging of Wivenhoe's first Health and Healing Fair, held at the Loveless Hall on Saturday. 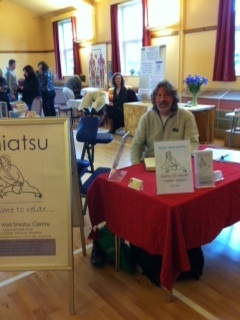 A fantastic mixture of stalls, workshops and live demonstrations (I particularly enjoyed Richard's yoga) created a really good atmosphere and people hung around for ages. 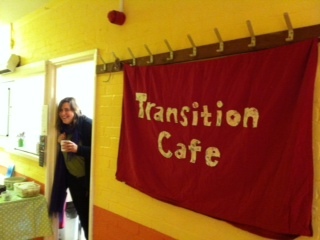 Aided in part, we hope, by the fresh coffee, cake and soup of the Transition Cafe. Which was a huge hit! Well done to all those involved; the food was all home-made and we were busy pretty much from the moment we opened until closing at 5pm. I'm not sure how many people knew it was a 'Transition Town' Cafe, but we put up our banner and I certainly cobbled a few people to talk about why we exist and what it is we're trying to do... that question "What is it that TTW is trying to do then?" always makes me think again and re-visit the issue of why we came together in the first place! On different days I talk about different things. Sometimes you can't shut me up about the model chicken-project, on others I'm much more aware of how far our food has to travel before we get to buy it. On still other days, I'm all about the value of increasing community-cooperation and inter-dependence, and just having more fun together as a community. 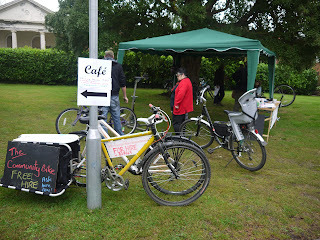 Anyway, the cafe was a great success and many of the stallholders came by to say thanks. So thanks to all. 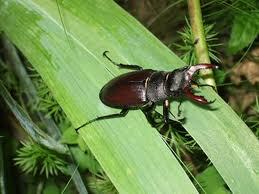 Steve offered amazing Shiatsu 'taster sessions' for a fiver at the Fair. I had one and it was lovely! 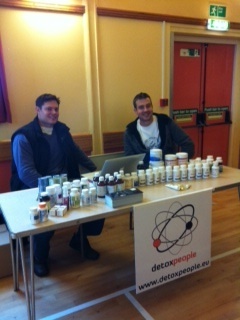 Stefan and Gareth offered a selection of super-nutrients, sourced from the States. Since Lisa Newman was feeling a little camera-shy, I took her place for a moment... and quite possibly scared away some customers since I look like a mad-woman. 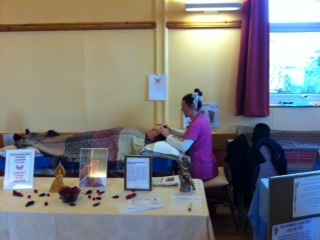 Maria Rooney of Butterfly Therapy. In this photo I think she's doing Chinese Facial Massage. 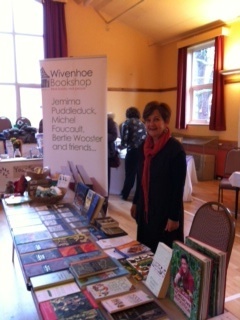 Ginny had a terrific selection of health-related reading, from the ever-wonderful Wivenhoe Bookshop. 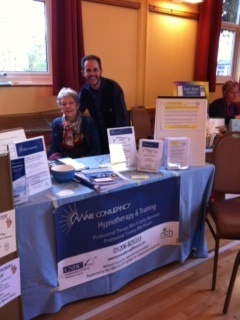 Alan and Denise, grand-masters of the event. Apart from event-organising, Alan also helps people feel a lot less stressed. 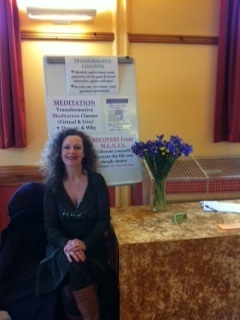 Viv Eunson almost sold out of all of her herbal products! 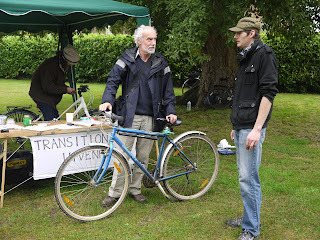 Dr Bike (aka Leon) was once again a very popular fixture at this month's Farmer's Market. 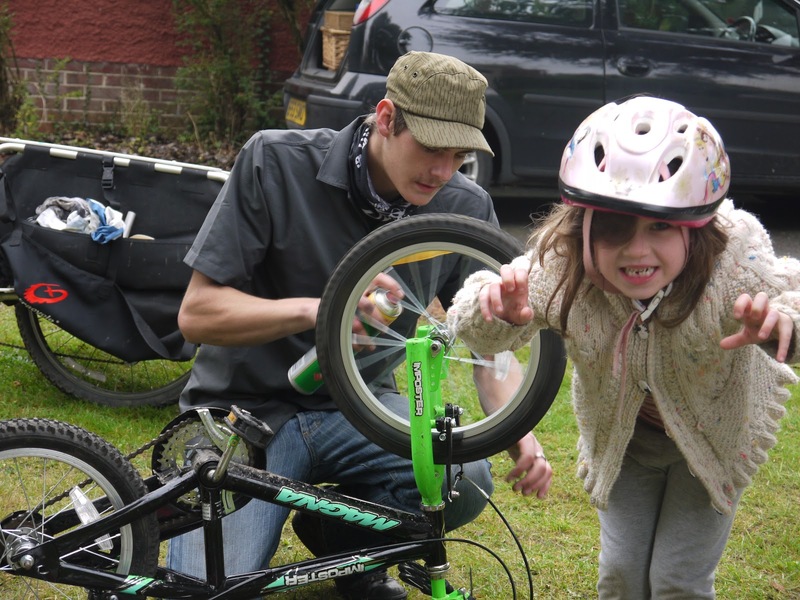 Transition Town Wivenhoe has sponsored two Dr Bike sessions so far this year - giving the community access to free bike tune-ups and hopefully helping more people safely onto their bikes. We hope to have him at another market soon, as he's been very busy! 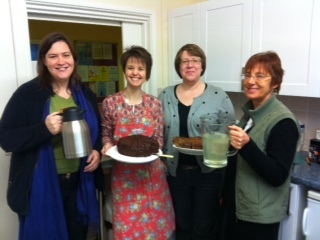 The TTW cafe team kept him supplied with delicious fairtrade coffee and cakes from the cafe inside the hall. Next market is Saturday 17th November 9-12 noon. Come and mooch, chat, eat, drink, shop and be merry. It's a lovely place to hang out on a Saturday morning... plus the cafe now sells cakes from the stalls (so you can try a piece before you buy a whole cake!) plus egg or bacon rolls cooked fresh to order on Carol's BBQ - which she lovingly lugs from home every month!!! 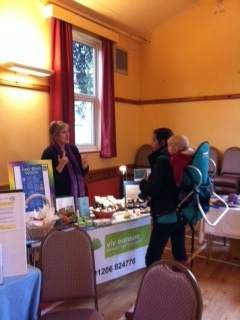 Thank you Carol and all the wonderful people who helped from TTW and Fairtrade Colchester. 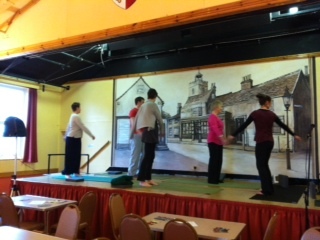 Some pictures from the wonderful Barn Dance! The local brew flowed, the band played and Wivenhoe got up and danced. What can I say? It was the most fun I've had in ages. Ok, so maybe I should get out more, but honestly, if you weren't there - make sure you are next year. You rarely see adults having so much fun with virtual strangers, and all pretty soberly (the dancing seems to sober you up..) and with kids of all ages in the mix too. Brilliant. Thanks to all the organisers and participants, I hope we can organise it again for 2013.
p.s. I'm going to put up more pics on the TTW Facebook page, if you're interested. They're mostly a blur tho - quite hard to take pics of dancing! We were swamped with bicycles last month, so Transition Wivenhoe's fantastic Bicycle Repairmen are back at the Farmers' Market on Saturday 20th October offering free bicycle checks and a tune ups from 9am to 12pm. 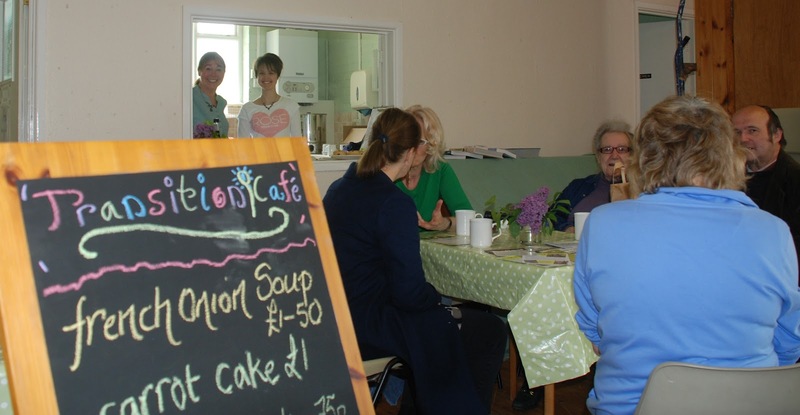 Don't forget Transition Cafe & BBQ also at the Farmers' Market - serving hot and cold drinks and freshly made Wivenhoe rolls filled with bacon and other goodies from the market stalls. Community Chicken Shed: Eggs Available! This is the box you can get your eggs from - and a small (round white) ball to put any donations in. 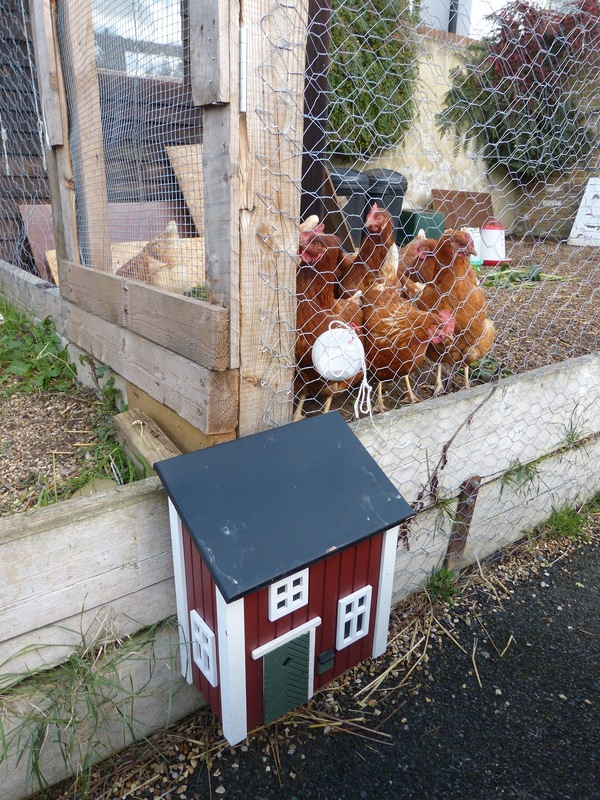 The Community Chicken Shed is proud to bring you fresh and delicious eggs, courtesy of our small flock. The chicken shed is a community project, with many different people involved in looking after them and ensuring their welfare. The aim of the project was not only to produce eggs, but to learn about chicken-keeping and then to act as a repository of that knowledge for the community. That way, if someone is interested in keeping birds in Wivenhoe, and wants to chat over the pros and cons (there are some - we'll be honest!) then we are available to assist. 'Transition' as a movement encourages this sort of knowledge-sharing and cooperation, so please do email if you want to get involved with this flock, or are thinking of starting your own, and we can help. p.s. In case you don't know already, the chicken-shed is the big coop in The Station pub's car park. Barn Dance Tickets on Sale! Don't miss this year's barn dance at the William Loveless Hall, High St on Saturday 6th October 2012. Doors open 7.00pm. Tickets are £10 (children free) and on sale from Wivenhoe Bookshop, or take your chance and buy on the door - though be warned, last year was a sell out! The bar will have local ale from Sticklegs brewery, lager, wine and soft drinks. There will be local seasonal nibbles included in the ticket price. 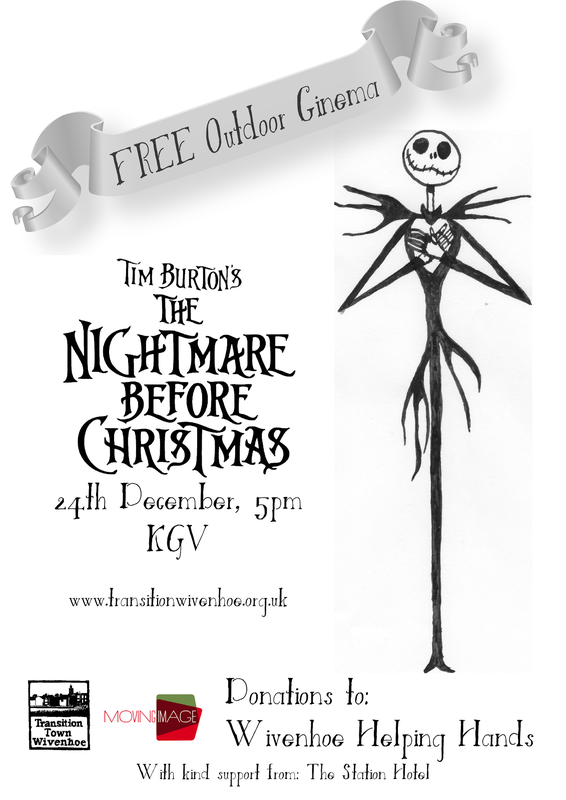 And the fabulous Hosepipe Band will be doing the tunes and the calling. Inspired by the Olympics, but the old 3-speeder not letting you perform at your athletic peak? Fear not! TTW have arranged for friendly bicycle mechanics to provide FREE bike checks and tune ups at the Farmers’ Market - Sat 15th 9am - 12pm - Congregational Hall, High Street. Wivenhoe. This isn't Wivenhoe, but it could be. Sea Ice is about to hit the news again. Last year I bloviated a bit about why it’s important for climate (remember climate?). I even had a little wager with Ruth on whether or not there might be a record breaking melt season, beating the previous low from September 2007. This year, away from the imminent headlines, something else is happening. Sea ice extent (a way to measure surface area) is still all important for climate, but as we crash through previous records it’s important to understand that this year's ice might be the Arctic Ocean’s last hurrah. The real story perhaps isn’t surface area at all, but ice thickness. Thick sea ice that has built up over many years is robust, it can withstand a storm or a warm season. But behind the scenes (and harder to measure) ice thickness has been declining much faster even than headline grabbing observations of extent. Areas of multi-year ice, even where they still exist, have become so fractured now that they no longer have any structural strength. Warm water has been eating at the ice from below. Pools of sitting melt water has acted like lenses focusing the 24hr sunlight and concentrating melt on the surface. Heavy snow fall in winter (increased precipitation is another consequence of warming) rather than adding to ice thickness has instead acted like a layer of insulation and prevented its re-thickening. Whatever ice that’s left from now on is a sitting duck. 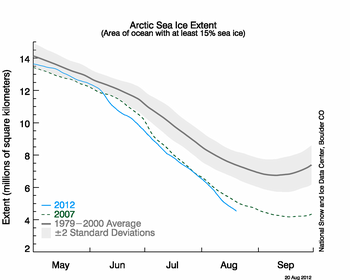 After 2007 there was some speculation that the ice may have reached a tipping point - a point of no return. That was rightly criticised because we didn't have all the facts at hand. Now, thanks to records from ice breaking ships and confirmed by a new generation of satellites we're getting the full picture in 3D. Arctic sea ice has literally collapsed. The vagaries of weather are all that stand between now and ice free summers in the Arctic Ocean. Planet Earth probably hasn’t seen those for at least a million years. First share of the Harvest and what a share! I collected my first share of vegetables yesterday, delivered to the Wivenhoe drop off point by Meg from Bennison Farm, where she and Danny have been growing food only since Spring this year and organising their 'Community Supported Agriculture' scheme. And what a glorious, fresh, beautiful bag of veg it is. And, most importantly, supremely tasty! Hats off to them, and huge thanks. My £7 a week 'small share' in the farm gave me lettuce, potatoes, broad beans, rainbow chard, bulb fennel, French beans, a cute wee cauliflower, bunch of parsley, courgettes, pointy cabbage, beetroot and broccoli! The new chickens have arrived! And are happily settling in to their new home behind The Station pub. Altho initially nervous, as you can see they are getting more used to human company with each passing day. They are not old enough to begin laying yet, but when they are, eggs will be available to the Wivenhoe community via an honesty box system. Thank you to everyone who has helped get this project up and running, to all the supportive neighbours and to those looking after them now. Clucking brilliant. Bennison Farm CSA is holding it's second work day on Saturday 21st of July! Weather permitting! It’s an opportunity to see the land, meet each other and to officially join the scheme. If you are planning on attending it would be ideal if you can join up then and there so having cheque books or cash (£24/£12 per year) with you would be a good idea. Transport: Would those who come please let Meg know how they plan to travel so that we can ensure there is space for all vehicles, and we'll try and sort out lift shares where possible so let Meg know if you have a spare seat in your car to offer. Public transport: The nearest station to the Farm is Great Bentley Station which is bikeable to and from the farm. For detailed directions please email Meg. For a map of how to find us please go to our website and click on the ‘Find us’ button. The land's postcode is CO7 8HT. There will be signs marking the gateway. As we are awaiting the start of the veg share on the 30th of July we have some types of veg coming through now which will be for sale on the workday at wholesale prices. All in all come along and have a go, meet some people and enjoy. Veg Shares - sign up now! All involved with Bennison Farm CSA are delighted to be able to tell you that the start date for Veg shares is just round the corner. The first Veg shares will be going out on WEDNESDAY 1ST AUGUST 2012 . Please mail Meg for the full and updated membership pack with both sets of membership forms and a comprehensive explantation of how the scheme works and ways for you to get involved. Due to the fact that we are only growing on 2 acres this year we have just 30 veg shares available, so please get in touch soon if you would like one! More veg shares will become available next year as we increase the land in production. As always, if you have any questions please get in touch. The Dedham Vale Food Hub is a group of farmers and consumers who, together, have created a vision for the future of local, low carbon food. The Hub aims to provide food to local communities in order to meet the needs of tomorrow’s consumers today through offering local, seasonal healthy low carbon food; all of which is sourced in and around the Dedham Vale. Scrumptious loaves made by Laura, Bob and Lynn at a 'Real & Slow' TTW bread making session this afternoon in Wivenhoe. I really enjoyed sharing some of the skills I have learned from working at the Slow Dough Bakery. I hope we can find ways to share and spread bread making skills and get local shops selling the real thing too. I Felt like shouting I found one, I found one! Ok, so it might not be the first one of the year and you have already seen your first one but this was mine and it was in our wild life garden. I went along as things had been quiet on this project since the May fair. The planted area looks great and I'm looking forward to the next round of activities, maybe it'll be the pond next, can't wait. So, we have two chickens, each producing one egg per day, the rationale is one of your chickens will provide you with an egg-a-day and the others will be sold to pay for the feed and some pocket money! This is only an idea suggestions are welcome...but I do want to move quickly on this. I'm proposing the shed is constructed this Sunday around 2pm, we need volunteers and investors to help pls. The discrete little spot AKA the Station Garden had something of an international visitor last week in the form of Prof. P Bartlett. The story began with an email from Essex University to Bob of TTW fame asking if TTW would host for an hour a Professor from the USA! OK, so what would the professor like to see? It was good to hear the perception of the university is that TTW have something special to share regarding the practice and principle of community action. So Ruth and I organised a brief guided tour. We started at the station garden, introduced the professor (Peggy) to the chickens! Visited the new chicken project, a quick look at the river and then up to the wild life garden returning to the station garden. Interestingly what we found ourselves talking to Peggy about wasn’t the success of TTW in terms of yield but what had been going on as a result of people coming together, community. 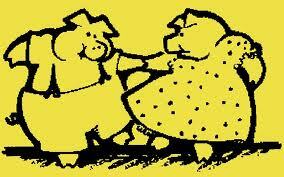 It’s that which interested Peggy the most, how communities form from like minded individuals. After meeting the lovely folk from the Transition Wivenhoe Food Group at the Greyhound last Monday I agreed to help out with the brand new Transition Cafe at Wivenhoe Farmers Market on Saturday. The market opens at 9am and I arrived at 11am to help with the last shift, finding the Congregational Hall full of people and a some fantastic stalls selling enticing food and local produce. The Cafe was, I believe, very popular with traders and attracted a fair number of punters who seemed to enjoy being able to sit down for a cuppa and enjoy sweet treats such as the traders' delicious cakes and scones in the buzzing hall. Fancy coming along? Let us know your thoughts on the cafe. Email us ideas, comments and offers of help! Interest in the Station Garden this year was high and our wonderful volunteers shared their knowledge with enthusiasm. Visitors began to arrive just before 10am on Saturday and Sunday. The garden was beautifully decorated with bunting. Most of the visitors I spoke to were surprised to see so much growing in one space, we explained some of the basic principles of forest gardening clink back on this link to find out more. The Wivenhoe Open Gardens ran from Friday evening to 5pm Sunday, in addition to organising the Station Garden the Transition Town Wivenhoe volunteers also supported the farmers market on Saturday morning by running the first coffee shop and on Sunday more wild flowers were planted in the new nature garden. Wow! what a team. Ooops we forgot to organise the May Fair! Once upon a time this week it was noticed that the lovely Wivenhoe May Fair needed some more elves and fairies to help make it sparkle and shine. So, why not shake of your hesitation and offer up just an hour or so of your time on Friday, Saturday or Sunday to help make the magic happen again. It's Saturday May 26th, noon to 6pm on the King George V playing field. Transition Wivenhoe are organising Recycling Teams during the event and for the morning after. Help put the big tent up for the pedal powered cinema on Friday 25th from 11am. On Saturday 26th we need Cinema Ushers to help stop pedalers falling off the bicycles - drop in for a short stint and watch films at the same time anytime between 12 and 6pm. If you walked past this corner plot a few months ago it may not have caught your attention. When I waked by on Sunday I heared laughter and friends talking. For me the aim of this project is not to work doggedly to its end but to enjoy the journey of creating something worthwhile and meeting new friends. Working with nature in this way can have this effect and this group celebrate both nature and community everytime they meet. Wild Strawberries gooseberries forget-me-nots wild spinach Peas and beans, the wild with the wonderful ! This years new members brought with them creativity and enthusiasm. The community station garden has evolved from year to year and this year like other will bear food and fruit. One of the more organic developments of the garden is the material used to create the pea and bean wigwam. These twigs came from the trees and shrubs which were cleared from the site of the nature garden. And a blast from the past, Osh kosh is back! Help with the station garden please! Well here they are! 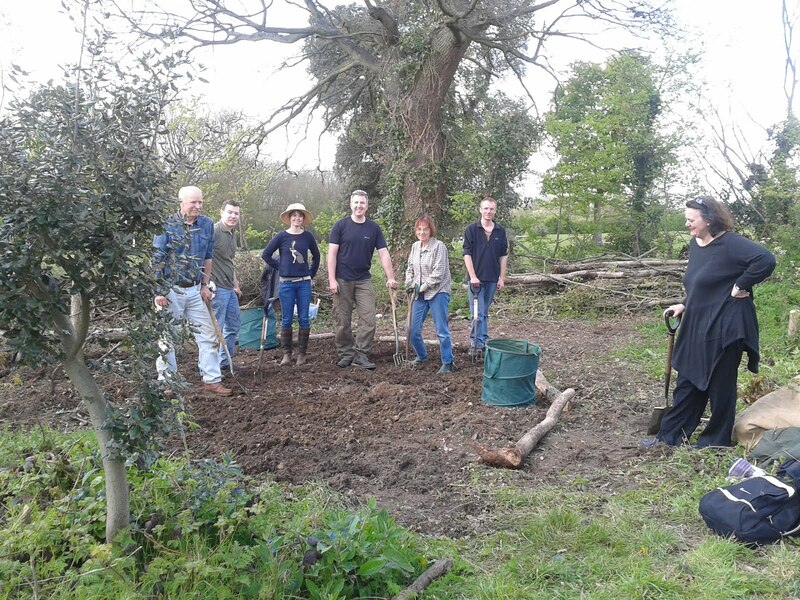 This enthusiastic team of volunteers turned an overgrown peice of scrub land into the beginnings of Wivenhoes wildlife garden, and it looks great! The Saturday 'A' team cleared the area which included a 20'' tree. most of the branches and trees from the site have been used to mark the pathways, deadwood has been used to maintain Stag Beetle habitats. The next stage will include wildflower planting and digging the pond.